The Maine Windjammer Association is made up of individual ship captains dedicated to preserving Maine's maritime history. Collectively the fleet's eight ships, all independently owned and operated, welcome more than 4,000 visitors each sailing season. Once essential for transporting goods along the East Coast -- including seafood, lumber and granite -- 19th-century coastal schooners almost became obsolete with the growth of the railroad industry. In the 1930s, artist Frank Swift began purchasing old wooden schooners with the goal of offering visitors a sailing vacation along the scenic Maine coast. By the 1940s, Swift had a flourishing business. Following Swift's lead, other sea captains began offering windjammer cruises in the 1950s. They began informally promoting themselves together in the 1960s, finally creating the Maine Windjammer Association in 1977. 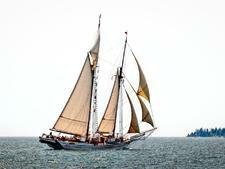 Launched in 1962, the 90-foot-long Mary Day is a two-masted schooner, based in Camden, Maine. It sails from early June to late September, offering three-, four- and six-day cruises with no set itinerary. Windjammer schooners are intimate ships in all ways, ranging from 16 to 40 passengers. Their small size makes nature -- including eagles, whales, seals and porpoises -- seem incredibly close. 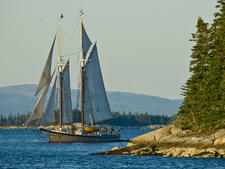 Scenery includes some of Maine's rocky coast, its small islands and quaint villages. Each evening, the schooners drop anchor in a new harbor and passengers have a chance to go ashore and explore. Windjammer cruises are affordable, averaging about $200 per person per day, with all meals, accommodations and activities included. Accommodations are simple, consisting of single and double cabins that come with sinks, comfortable beds and blankets. Most bathroom facilities are shared. Hot shower facilities are promised on each ship. While some of the ships have outlets for hair dryers and razors, the emphasis is on unplugging from regular life, including the internet. All shipboard meals are served family-style and feature local favorites including fresh seafood, homemade breads and chowders and desserts. An on-island lobster bake is a part of many cruises. While alcohol is served on some ships, most cruises are BYOB. The ship will supply ice chests for beverages. Each day generally includes about six hours of sailing. While onboard, passengers are encouraged to participate in all aspects of sailing, from raising and lowering the sails to taking a turn at the wheel. Some even choose to help cook and set the shared table. They may also choose to read, watch the scenery, sunbathe and relax. There are no organized activities. Fellow passengers may include honeymooners, retired couples, families with children and single people. A certain level of mobility is required as most ships use ladders to move between decks. All Windjammer ships have a minimum age requirement. Victory Chimes is open to ages 10 and up. All of the other ships have minimum ages between 12 and 16. 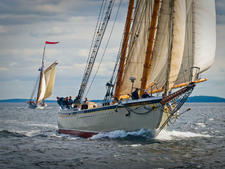 Each of The Maine Windjammer Association's eight ships are individually owned and operated. 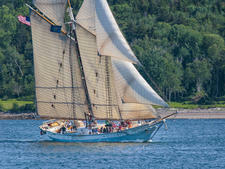 Based in Rockland and Camden, Maine, the fleet includes America's two oldest working schooners, built in 1871; a Gloucester fishing schooner; a 1922-era yacht, and an original three-masted schooner that is the largest passenger sailing vessel under the U.S. flag. Four of the schooners are considered National Historic Landmarks. Each ship is unique and vary in size and passenger capacity. The largest in both categories is Victory Chimes, which is 132 feet long and can accommodate 40 passengers. Heritage takes 30 passengers and is 95 feet long. At 130 feet long, Angelique carries 29 passengers. 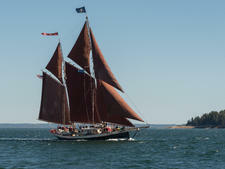 Mary Day, the first Maine windjammer built specifically for cruising, takes 28 passengers. American Eagle accommodates 26 passengers and is 92 feet long. Lewis R. French takes 21 passengers and is a National Historic Landmark, claiming the title of the U.S.'s oldest commercial sailing vessel. The 82-foot-long Ladona accepts the fewest number of passengers, 16, but the same captain owns Stephen Taber, a National Historic Landmark ship that is the oldest sailing vessel in continuous service; it carries 22 passengers and is 110 feet.